Just as I’m mourning the end of peach season, the scent of passion fruit perfumes the air. Ahh, yes. A delicious hug from nature. Here I go waxing poetic about fruit again. Sorry! At a Poketo cocktail making workshop a few summers back, I learned that cocktails need both sweet and sour elements to balance flavor. That way, your cocktail isn’t not too boozy, puckeringly sour or cloyingly sweet–and drinking enjoyment is maximized! 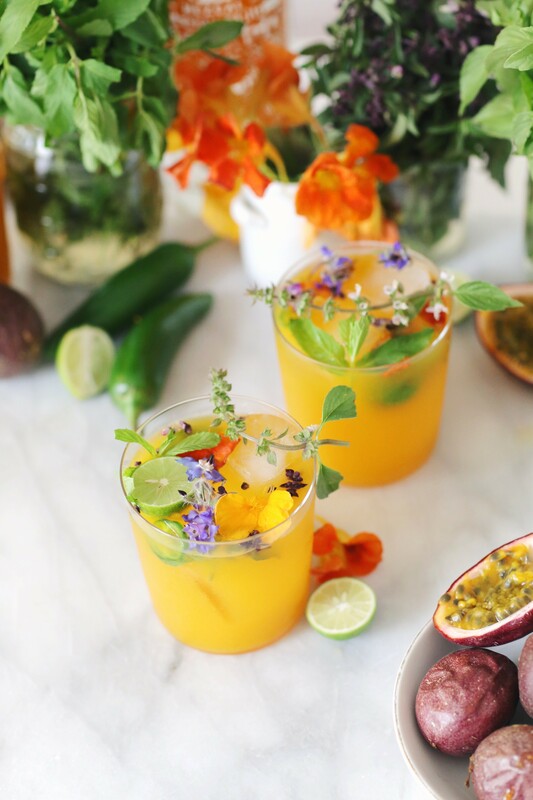 The tartness of passion fruit is perfect for the “sour” so I came up with this fun cocktail recipe. I used simple syrup as the sweet and added herby aromatics and jalapeno for spice to go with Mezcal. Cheers! Tip: By the way, if passion fruit is out of season, you can find passion fruit puree in frozen packets in most ethnic markets. Bonus, it comes deseeded. In a shaker, muddle mint, basil, jalapeno, and lime. Add Mezcal, passion fruit puree, simple syrup and ice. Shake, strain and serve over ice. Garnish with fresh herbs and edible flowers like nasturtium, borage and basil flowers. **Thanks to Kimpton’s 2017 Culinary and Cocktail Trend Forecast for inspiring and sponsoring this recipe.